When looking at the Pilot Precise two weeks ago, it occurred to me that there might be people who don’t have Pilot pens available, or don’t like them, so I looked into a different set of pens that have similar features. 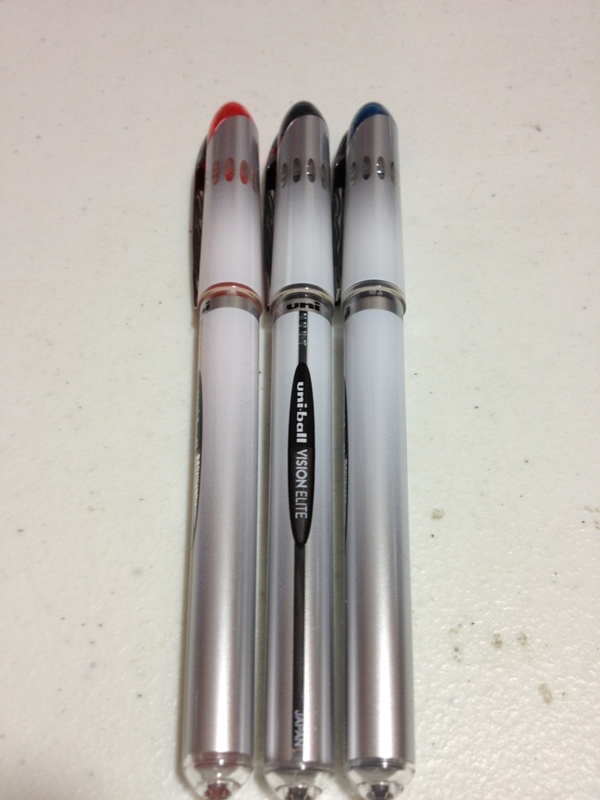 And I found the Uni-Ball Vision Elite Bold, in Black, Red, and Blue. The body and cap are simple and smooth, with a nice white-to-grey fade, a conical top, and a rounded bottom. The clip is metal with a few divots and is very tight. The top of the cap has the color of the ink and there are a few windows below to allow you to see the feed. On the barrel, the brand is stated twice and the model once, but there is no size information. 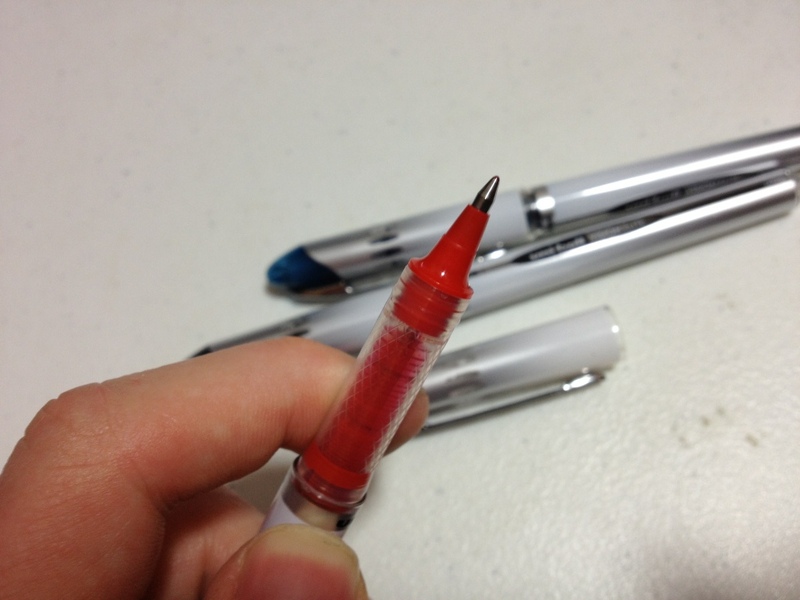 Removing the cap exposes a transparent yet grip-covered feed, and the conical tip to a standard metal roller-ball point. The three inks aren’t too special in properties. The black is a thick, nice color. It is a warm black, fairly formal, etc. The bold line on all of these pens is enough to bleed through on cheaper copier paper, but the ink dries surprisingly fast. The blue is a dark blue, again fairly formal. It’s almost a navy or a blue-black color and it works well in most situations. I’d say it’d even work well for some artistic endeavors. The red is fairly bright and red, but it isn’t eye-hurting. It is a very deep, nice color, but it could still be considered aggressive. It is also good enough to have some artistic potential. The point is nice, and it writes smoothly, especially in the bold I have here. There is a lot of line variation, though, meaning drawing is a bit harder (or easier, depending on how you look at it). Like I said, there is some bleed-through, but not much. The writing is dry almost instantly from when I pick up the pen, which is amazing and leads to a much smoother writing experience. Overall, the Uni-Ball Vision Elite is a great little roller-ball with quite a few office applications. The colors are nice without being overbearing, and the writing experience is fast and clean. Artistically they are limited, having little line consistency, but on the color side they have potential. They’re a nice set of pens.